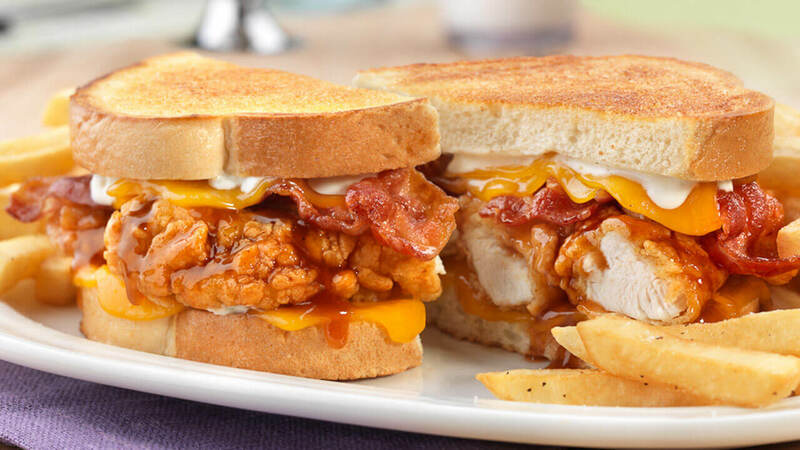 Country-breaded, all-white chicken tenders smothered in sweet honey BBQ sauce, melted cheddar cheese, applewood-smoked bacon and Ranch dressing on freshly grilled sourdough bread. Country-breaded or grilled chicken tenders, lettuce, tomato and Honey Mustard dressing all wrapped in a tomato tortilla. A classic Friendly's hot dog served on a warm grilled roll (hot dog contains milk*). Crisp strips of applewood-smoked bacon, fresh lettuce, tomato and just the right amount of mayo on toasted sourdough bread. We do the Rueben right! Stacked high with fresh Brisket corned beef, melted Swiss cheese, tangy sauerkraut and Thousand Island dressing on freshly grilled honey-dill rye bread. Our Tuna Rolls are made with freshly prepared Albacore tuna salad and crisp lettuce on a grilled roll. Freshly prepared Albacore tuna salad, melted American cheese and tomato on freshly grilled sourdough bread. Enjoy slices of turkey breast, applewood-smoked bacon, lettuce, tomato and mayo on toasty white bread. Turkey breast layered with applewood-smoked bacon, melted American cheese, tomato and Thousand Island dressing on freshly grilled sourdough bread. There's something special about grilled cheese and tomato soup! Served with a warm crock of creamy tomato basil soup, our melty, pull-apart grilled cheese is something to write home about.